In addition to the fame of the gorgeous portrait painter V. G. Perov, he gained fame by writing realistic genre scenes. Earlier, in the 1870s, he worked mainly on canvases with a social orientation and an accusatory character. Later, the Russian painter turned to the description of the everyday life of ordinary people, often in an ironic vein. Such is the painting “Fisherman” in 1871. On the canvas we see several separate compositional plans. The main figure of the painting is an elderly man on the shore of a lake, busy with fishing. He sat down slightly, obeying the desire to wait for the bite. The old man’s gaze is fixedly directed beyond the limits of the image, where, according to the logic of the picture, there is a fishing rod float. 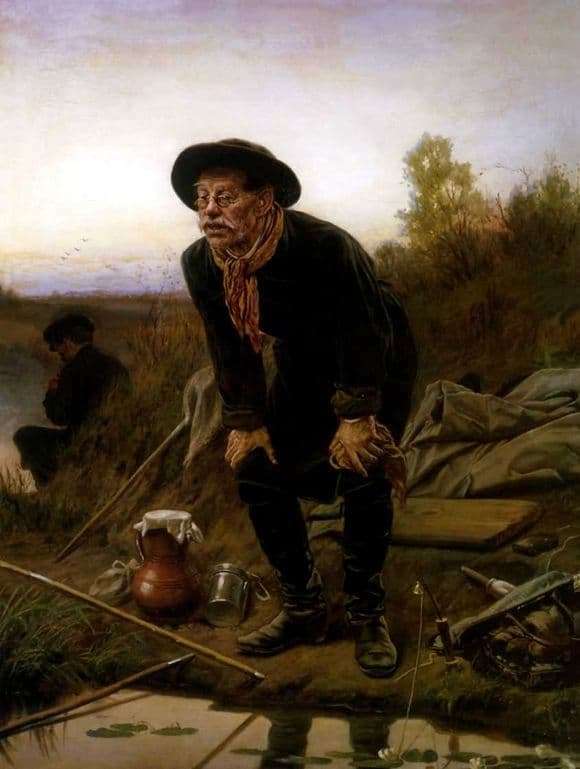 With deep psychological psychology, Perov showed an enthusiastic fisherman. In the guise of a character read, as if the whole world around us ceased to exist, – so much he is immersed in the process of catching. From the clothes of a fisherman, one can understand that he belongs to wealthy merchants or landowners: a beautiful bright scarf is tied around his neck, his boots are polished to a shine, his shirt is neat, and his head is crowned with a fashionable hat. Strong contrast is the far plan. A modestly dressed and sullen man pulls the bait on the hook. The viewer unwittingly realizes that the first person is fishing for fun, and the second for serious business is getting food. A separate plan is the area around the figure of an enthusiastic fisherman. Perov worked in detail a still life with fishing utensils: a jug, a can, a net, several fishing rods. In the upper part of the canvas, the morning sky turns white. Young birch trees spread out green branches on a hillock. In the atmosphere of the painting “Fisherman” there is a happy harmony between man and nature. This wonderful work of Vasily Perov is in the Moscow Tretyakov Gallery.